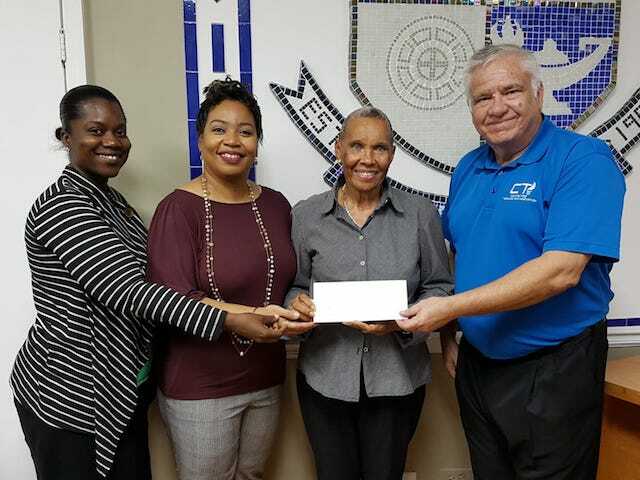 The Bahamas Technical and Vocational Institution (BTVI) has taken the pink pledge, joined the fight against breast cancer and donated $1,100 to the Sister Sister Breast Cancer Support Group. This donation will assist with the purchase of a port for a newly diagnosed patient. A port is a medical device that allows chemotherapy medicine to be given through a special needle that fits into the port and sits just under the skin. Since 2011, BTVI has been a supporter of promoting breast cancer awareness. With community engagement being one of BTVI’s strategic plan goals, the institution held its annual Pink Awareness Bake Sale, with 100% of the proceeds going to The Sister Sister Breast Cancer Support Group. During the event, staff and faculty joined students in purchasing treats to show their support.